posted to Ruleson September 23, 2013 by FingerLakes1.com, Inc.
BOSCOS VILLAGE PUB Voice: 4841222 201 Cogswell Ave.
Dues are $5/person/night payable into the machine before you start your match. The machine will not start play until each team has inserted $20.00. Please use $5.00 bills. Sponsor fee is $80.00/team payable by November 1st. Bills will be hand delivered to each bar by October 15th. Sponsor fees not paid on time will result in your team receiving ZERO (0) points until sponsor fees are paid. If your team forfeits you will still be responsible for the $20.00 in dues and there will be an additional $20.00 forfeit fee deducted from your final winnings. If your team forfeits 3 times you will be dropped from the league. If teams drops you forfeit all fees paid. 1) The official league game will be 2 games of “501” down, 2 “501” di/do and 8 games of cricket. The final game of the match being “701” oi/do with all 8 players participating. (In a nut shell, each player will play; 1, 501; 1, 501 di/do; 4 cricket; and a game of 701 oi/do.) The double bull will be active on all games except the 301. Games are comprised of 4 players from the names registered on the official sign-up sheet with up to 4 players being designated as subs. No more than 8 players will show up on the board. You must be 21 years to play. This is in compliance with New York State Liquor Authority rules. 2) Locations that have two or more teams may not shift/juggle regular players from one team to another. 3) Game time is 7:30 pm. In times of bad weather, or some other uncontrollable delay, i.e., traffic tie up due to an accident, teams will have 15 minutes to show. Forfeit time is 7:45. If it is a forfeit you must put in your dues and select your team. Follow the forfeit procedure sheet when registering a forfeit. 4) A forfeit will result in a net score of 0 wins and 13 losses for that evening’s match by the team that forfeits. 5) In the event of an absent team player, and your subs are not available, a sub may be taken from the bar on the night of the league. Subs cannot have played or subbed for any other team from another bar. Subs average must not be higher than the highest player on the team. No new subs may be brought in the last 3 weeks of the regular season. 66) Games may be played with 3 team players. The vacant players turn being skipped for each turn until the 4th player arrives. 7) When/if absent team member arrives, he must wait until completion of game being played and then be inserted into line‑up for the next game. 8) In case of extenuating circumstances, and you have to reschedule a match you must notify the opposing team captain, the tavern and Stanton Automatics at least 48 hours in advance. This however does not guarantee that your opponent will reschedule the match. 9) Any physical violence will result in the guilty player and/or team being expelled form the league and forfeiture of all points and monies paid. 10) Abuse of equipment, poor sportsmanship, or unethical conduct may be grounds for forfeiture of a game or match, or expulsion from the league. 11) Any dispute that can not be settled by the captains must be received by Stanton Automatics, 2150 Ellis Dr., Auburn, NY 13021 within 48 hours. 12) All team members may discuss a shot once a player is at the foul line. Please keep in mind the general fouls section. COACHING BY TEAM MEMBERS ONLY! 13) All ties for places will be decided by head to head total points. 14) All prize monies and trophies will be awarded at the annual banquet. 15) Annual banquet cost is included in your weekly dues. The only deduction from dues will be the cost of plaques. Any forfeit money collected will be used to offset the plaque costs. We will pay for wins and losses. 75% of the money goes to wins and 25% of the money goes for losses. If there are any questions on these rules, please feel free to contact Stanton Automatics. 1) All of the regular season rules still apply. 2) First team to win 7 games wins the match. 3) Dues will be collected for the play‑offs. 4) Any team that forfeits or does not play in the play‑offs is still responsible for dues. 5) Subs must have played 3 matches for the same team during the regular season. 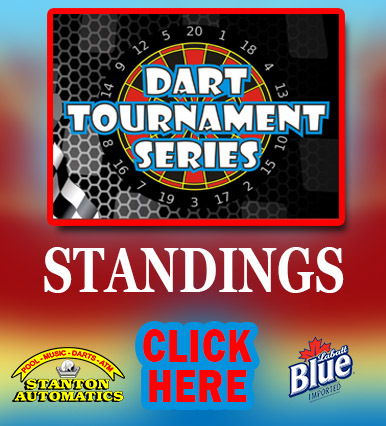 Stanton Automatics sponsors dart leagues playing on electronic dart boards in a Tavern setting. Leagues play cricket, “01”, and combinations of the two. “01” games begin with 301, 501, or 701 with the player attempting to hit a combination of total points to bring the score down to zero. Players partners’ score must be equal to or less than the combined opponent’s score or a block occurs (Freeze Rule). An out while blocked results in loss of game. Most “01” games are played using a single bull where both the inside circle and the outside circle count as 50 points, the exception is for double in/double out games the outer circle is 25 points and the inner “double” bull is worth 50 points. In the game of cricket the player/team attempts to close the 20s, 19s, 18s, 17s, 16s, 15s, and the bulls by hitting three of each. Points are obtained by hitting a number that is only closed by your team, when both teams have closed a number it will no longer score points. The first team to close all numbers and have more points is the winner. Cricket is always played using the double bull. 1. Players stand at the “throw line”, 96 inches horizontally from the face of the dart board. It is legal to lean over the line. They may step on, but not across, the line. A. They must be plastic-tip darts. B. Flights may be any length as long as they do not exceed 8″ in total length. C. Flights may be no wider than 3/4″. As measured from shaft to flight edge, and may not have more than four wings. D. Complete darts may not exceed 18 grams in weight. 3. Each player throws a maximum of three darts per turn. Darts must be thrown only when the machine instructs to “Throw Darts” and the proper player’s name is lit. A player will always be allowed to throw all three of their darts. 4. It is not required for a player to throw all three darts on every turn. A player may pass or throw fewer than three darts. 5. Any dart thrown counts as a throw, whether or not it is registered on the machine. A throw counts if is misses the board and bounces out, or it misses the board completely. A player may not throw any darts over again. Dropped darts may be thrown again. 6. Darts on the board may not be touched until the turn is over, the “Player Change” is activated, and the machine recognizes the end of the turn. Exception: When a dart is in the board and machine reads “Stuck Segment”, that dart must be removed before other darts are thrown. 7. A round is defined as the period of time from the end of a player’s turn to the start of their next turn. In a game that is played with two players sharing a score, a round is defined as the period of time from the end of a players turn to the start of their partner’s turn. A. “Last Dart-Winning Dart” If the machine was displaying the “Throw Darts” message and all other rules were followed and the dart is sticking in the exact number needed to take out a game it will be scored. 2. A dart that sticks in the board and registers as a dart thrown but does not score will be corrected (the dart shows as “missed” or “blank”). 3. Any dart that registers two or more times will be corrected by removing the extra points awarded by using the back up button. 4. If a dart bounces it is considered a dart thrown even if it does not score. It may NOT be thrown again. 5. If a dart thrown before the “Throw Darts” message lights, the dart will not score and is considered a dart thrown. It may NOT be thrown again. 6. The CANCEL button is NOT a backup – Pushing it will end the match and team that cancelled will forfeit remaining games. It is each player’s responsibility to see that the machine is displaying the appropriate player’s name prior to throwing the darts. Play is stopped immediately when the infraction is noticed. The backup feature may be used to correct the following player errors if agreed by BOTH captains and corrections should be made by OPPOSING team. Players not in compliance with the rules are said to have committed a foul. During league play there is no official to make foul calls. Since many foul calls are judgements, players should calmly discuss perceived infractions and attempt to resolve them. If unable to do so, play should continue and a complaint made to Stanton Automatics the NEXT day – no disagreement is worth fighting and it will not be tolerated.